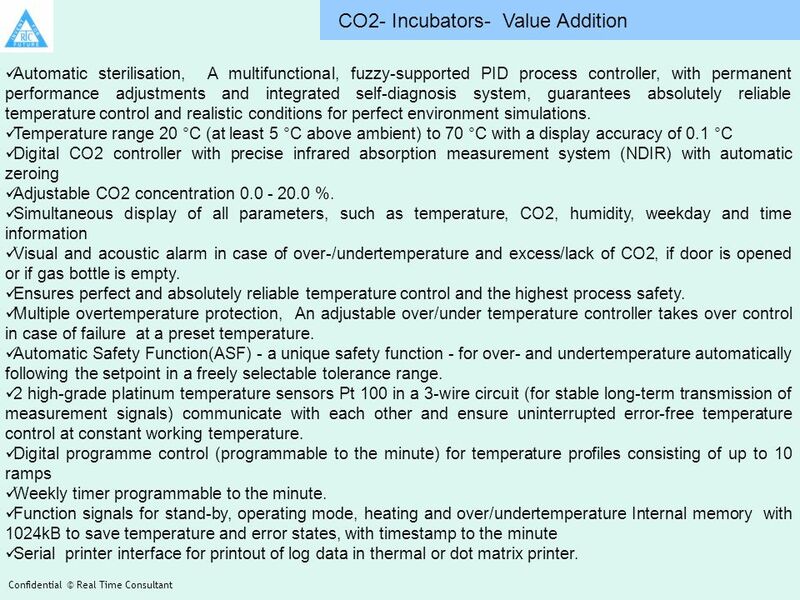 4 CO2- Incubators- Value Addition Automatic sterilisation, A multifunctional, fuzzy-supported PID process controller, with permanent performance adjustments and integrated self-diagnosis system, guarantees absolutely reliable temperature control and realistic conditions for perfect environment simulations. Temperature range 20 °C (at least 5 °C above ambient) to 70 °C with a display accuracy of 0.1 °C Digital CO2 controller with precise infrared absorption measurement system (NDIR) with automatic zeroing Adjustable CO2 concentration 0.0 - 20.0 %. 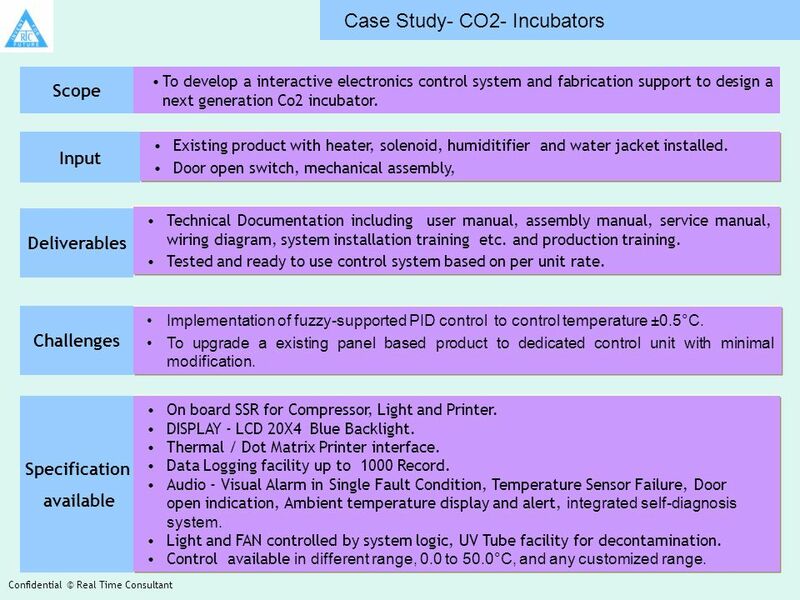 Simultaneous display of all parameters, such as temperature, CO2, humidity, weekday and time information Visual and acoustic alarm in case of over-/undertemperature and excess/lack of CO2, if door is opened or if gas bottle is empty. Ensures perfect and absolutely reliable temperature control and the highest process safety. Multiple overtemperature protection, An adjustable over/under temperature controller takes over control in case of failure at a preset temperature. Automatic Safety Function(ASF) - a unique safety function - for over- and undertemperature automatically following the setpoint in a freely selectable tolerance range. 2 high-grade platinum temperature sensors Pt 100 in a 3-wire circuit (for stable long-term transmission of measurement signals) communicate with each other and ensure uninterrupted error-free temperature control at constant working temperature. 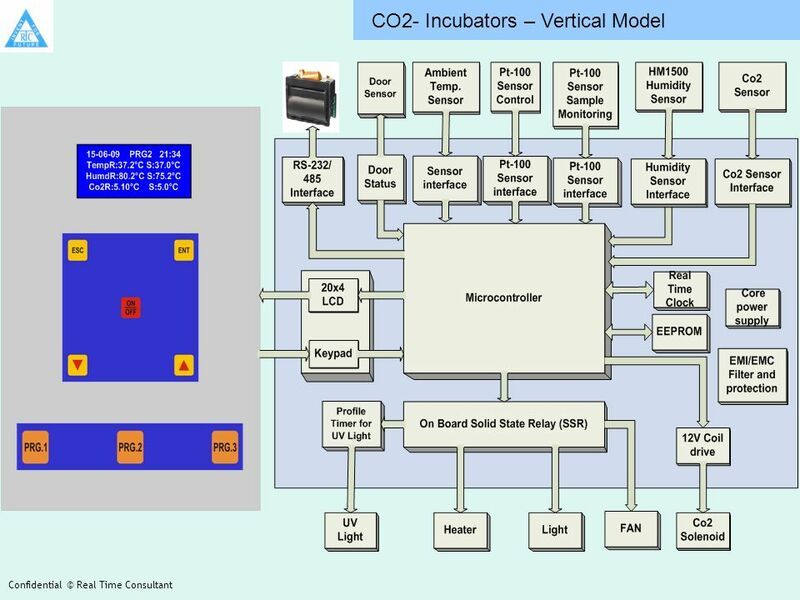 Digital programme control (programmable to the minute) for temperature profiles consisting of up to 10 ramps Weekly timer programmable to the minute. Function signals for stand-by, operating mode, heating and over/undertemperature Internal memory with 1024kB to save temperature and error states, with timestamp to the minute Serial printer interface for printout of log data in thermal or dot matrix printer. 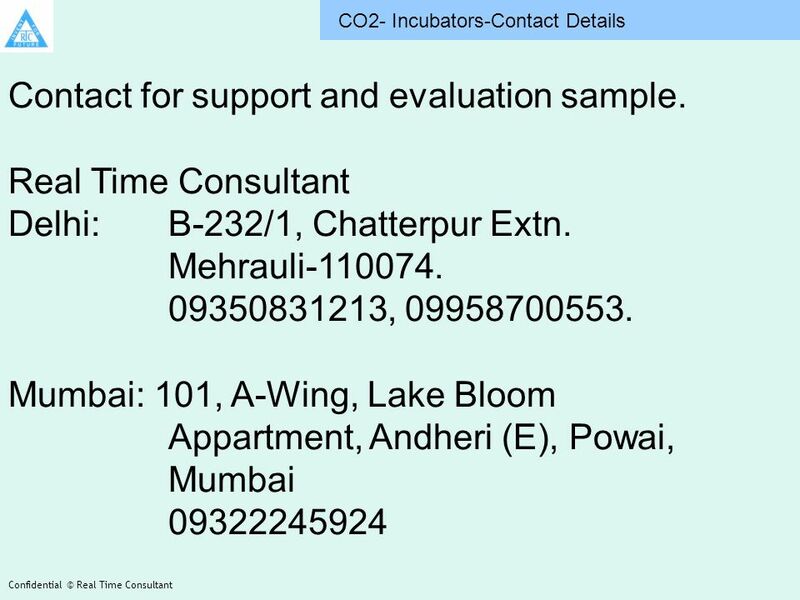 5 Confidential © Real Time Consultant Area of co-operation Product Design as per given specification. Ready to use solution based on Embedded H/W and Software. We deliver ready to use solution for your product with latest feature and requirement. Latest technology to meets international standard and feature. Complete customization of product as per customer requirement. 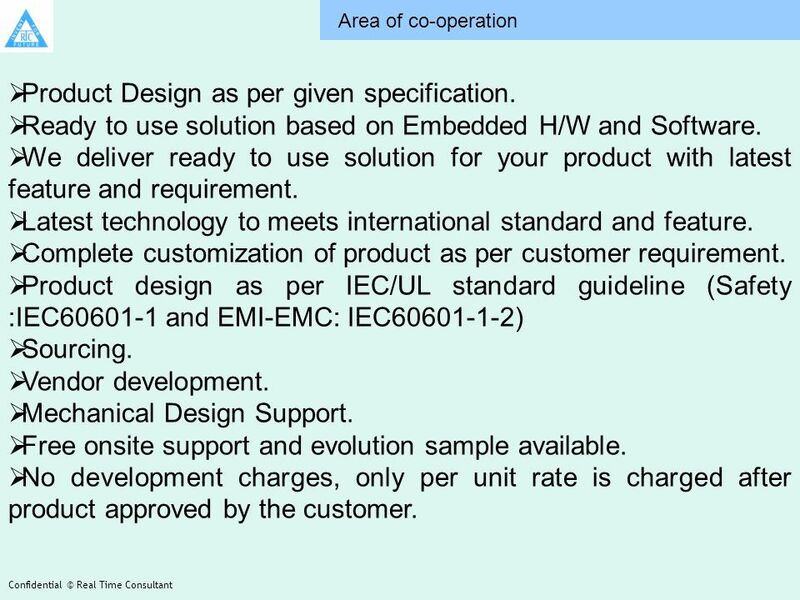 Product design as per IEC/UL standard guideline (Safety :IEC60601-1 and EMI-EMC: IEC60601-1-2) Sourcing. Vendor development. Mechanical Design Support. Free onsite support and evolution sample available. No development charges, only per unit rate is charged after product approved by the customer. 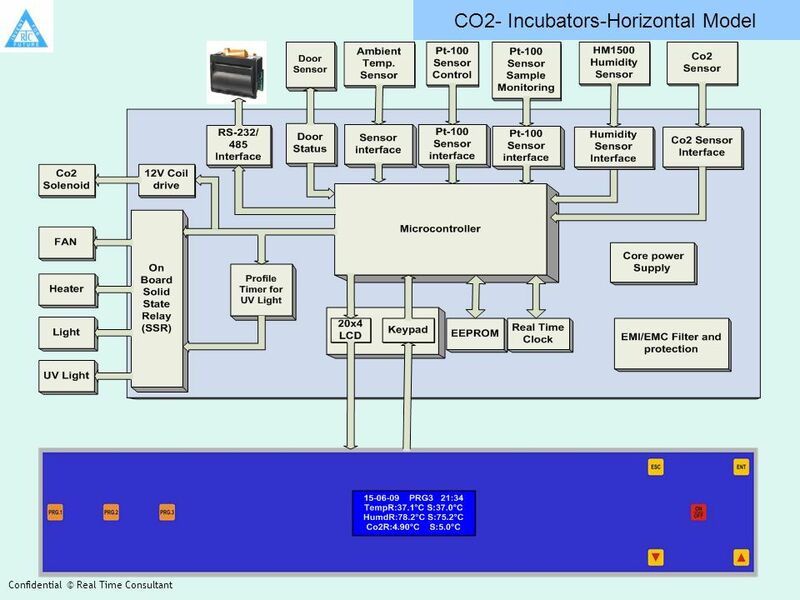 Download ppt "To develop a interactive electronics control system and fabrication support to design a next generation Co2 incubator. Existing product with heater, solenoid,"
Why use a Large Format Display vs a regular TV for your business? Eagle Trading & Agencies has been established from the ground up for selling, managing and implementing mid to large size projects in the field of fire. Customer Service – International dept. STAR 24 3 E.